Last weekend we ended up with several lamb shanks we brought from our stallholder Karapiro Meats. The Shanks were really meaty so one large one each was enough for us. We had been tempted to have lamb again after our enjoyment of the 7 hour lamb which I gave as a recipe a couple of weeks ago. These shanks were just as easy and equally flavoursome. We served them on a bed of wet polenta which absorbed lots of the juice. Mashed potato would also work well. On top of the stove place a little oil in a large casserole dish (which has a lid for later). Dredge each shank through the flour so both sides of each are covered. Brown both sides of each shank and then remove them and place on a plate or tray. If necessary add a little more oil, once hot enough add the chopped celery, carrot and onion. When they soften add the parsley stalks and garlic. Then place the shanks back in the casserole dish, nestling them amongst the vegetables. Mix in the spices and fresh herbs, add the wine and finally cover with the lamb stock. Preheat the oven to 160 c. Place in the lidded casserole dish and cook between 1hour 45minutes to 2hours. Check after an hour and if necessary turn each shank over. 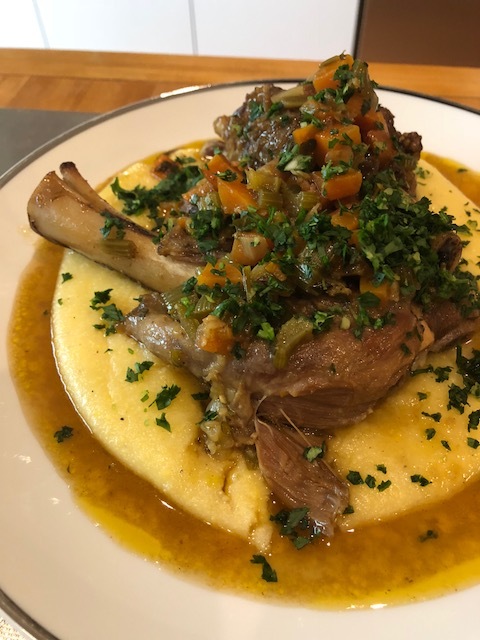 We served this on a bed of wet polenta made using the instant variety. We followed the directions on the packet. Sprinkle with gremola when serving – that’s finely chopped parsley, finely grated lemon rind (no pith included) and a finely chopped clove of garlic all mixed together.